The PubChem Substance Record page is now available. It complements an update of the PubChem Compound Summary page released six months ago. What is the Substance Record Page? PubChem organizes its data into three databases: Substance, Compound, and BioAssay. PubChem Substance (accession SID) contains nearly 200 million chemical substance descriptions provided by hundreds of data contributors. Each record has a webpage that displays contributed information provided by an individual contributor about a particular chemical substance. This page is called the Substance Record page, and it replaces the PubChem Substance Summary page. As with the recent update to the Compound Summary page, this new page loads much faster by minimizing the amount of data and the time to respond to requests. The new interface is optimized for both touch- and mouse-based devices. Using a responsive design, it automatically adapts to the available screen size, making it friendly for desktops, tablets, and phones. The new page is renamed the Substance Record page as it clearly shows the information provided to PubChem by the contributor. 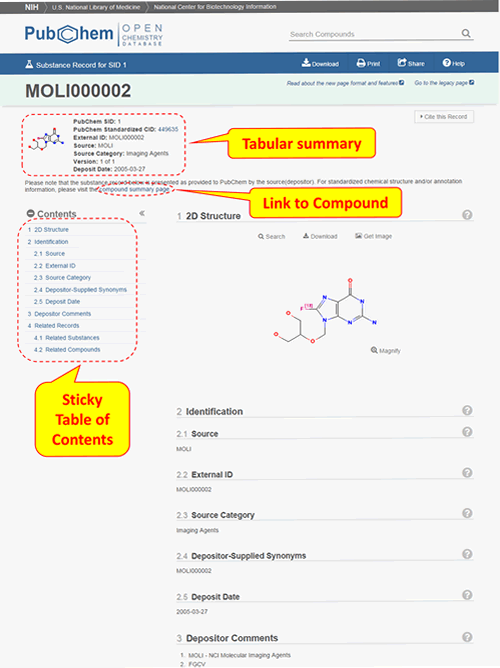 The older page was called the PubChem Substance Summary page and included additional derived annotation (making it confusing to understand what the contributor provided) and a direct interface to the Compound Summary page (adding user confusion as to the difference between a compound and substance record). The legacy Substance Summary page will be accessible until October 1, 2015; however, a redirect to the new pages will remain in place. Our next focus will be on redesigning the BioAssay Summary page.